Home /China, Taiwan/Declining Taiwanese identity? The results of Taiwan’s 2018 local elections shocked the ruling Democratic Progressive Party (DPP) and came as a surprise to some. In a total of 22 mayoral races, the DPP only held on to 6 seats, down from 13, while the opposing Kuomintang (KMT) won 15 seats, an increase of 9 compared to four years ago. The DPP even lost to the KMT in the mayoral race in the southern port city of Kaohsiung, where the DPP had been in control of city hall for 20 years. Figure 1 presents the widely familiar survey data collected by the Election Study Centre (ESC) of the National Chengchi University in Taiwan. It shows that an increasing number of island residents have identified themselves as Taiwanese during the past two-and-a-half decades, with the proportion increasing from 22 per cent in 1994 to about 60 per cent in 2018. During the same period, the proportion of Chinese self-identifiers declined substantially from 30 per cent to less than 4 per cent. The proportion of those identifying with a dual identity, i.e. seeing themselves as both Chinese and Taiwanese, also witnessed a significant decline from 50 per cent to less than 40 per cent. Consequently, very few Taiwanese citizens today subscribe to a Chinese identity alone, while more than 90 per cent of them now consider at least part of their identity as being Taiwanese. 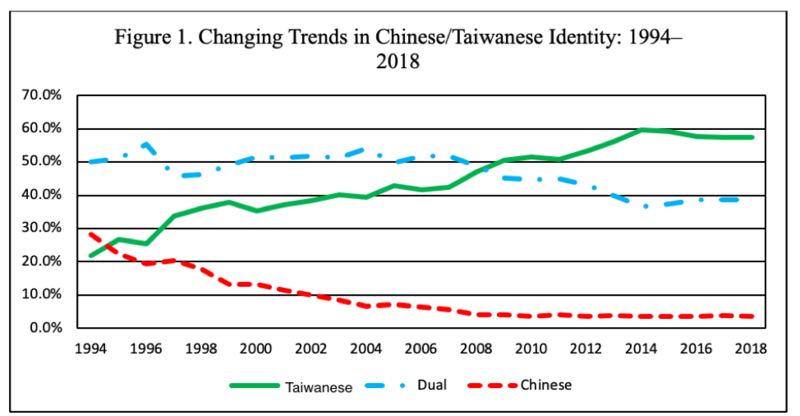 The decline in Chinese identity has been accompanied by a growing view that Taiwan is an independent country separate from China, as Figure 2 shows. 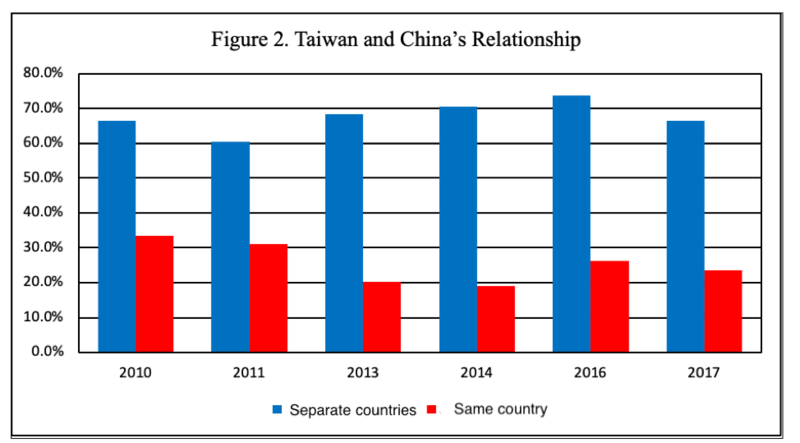 Close to 70 per cent of the island’s citizens currently consider Taiwan and China as two separate states, and only 20 per cent of them view the two sides of the Taiwan Strait as being part of the same country. Thus, a Taiwan-centred identity has become dominant among the island’s citizens. These results demonstrate that Taiwanese citizens are collectively rational, as they tend to choose positions that maximise their gains and minimise their losses. 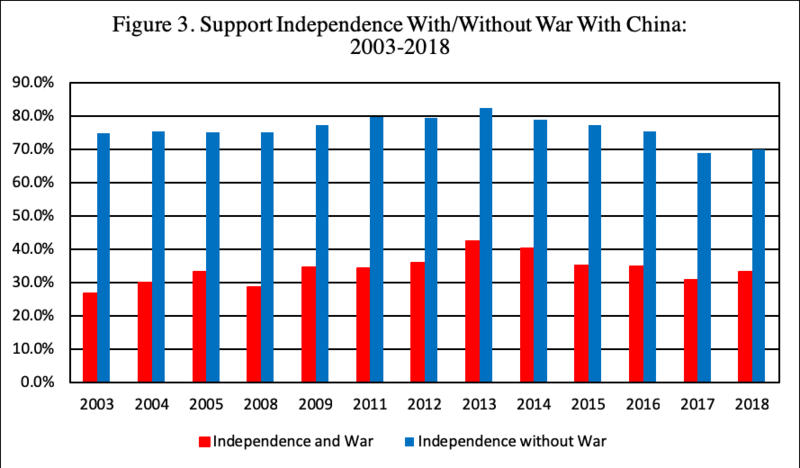 Indeed, the Beijing government, under Xi Jinping’s leadership, has heightened its efforts at military coercion and the diplomatic isolation of Taiwan. In addition to sending military aircraft to circle the island and depriving Taipei of its few remaining diplomatic allies in Central America, China’s leaders recently conducted a campaign to pressure foreign companies to alter their website displays. In an attempt to show Beijing’s claim to the island, China demanded that companies conducting business on the Mainland must not treat China and Taiwan equally, instead requiring that these companies refer to the island as ‘China Taiwan’ on their websites. 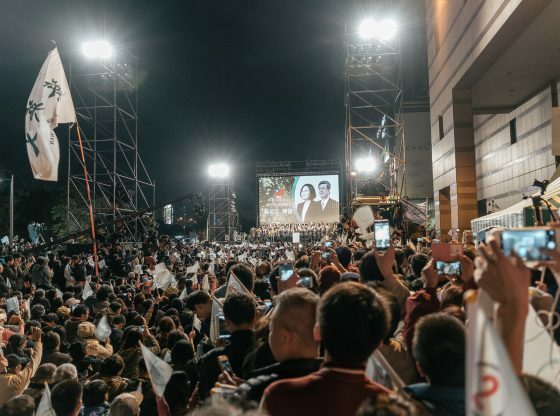 Referendum 13 caused a great deal of controversy in Taiwan, as many argued that it would not bring any visible benefits but would instead invite punishment from Beijing and further isolate the island country in the international community. Recognising these possible repercussions, the ruling DPP, which is the only political party that supports Taiwanese independence, distanced itself from the referendum prior to the elections. Thus one can infer that voters’ rejection of Referendum 13 is likely to be a result of their rational calculation. T.Y. Wang is Professor and Chair of the Department of Politics and Government of Illinois State University at Normal, Illinois, USA. He is co-editor of the Journal of Asian and African Studies. His recent publications include The Taiwan Voter (co-edited with Christopher H. Achen, University of Michigan Press, 2017) and ‘Declining Voter Turnout in Taiwan: A Generational Effect?’ in Electoral Studies (co-authored with Christopher H. Achen) (forthcoming). Image Credit: CC by Studio Incendo/Flickr. Why would “Chinese President Xi” even care if his “recent policy address on the 40th anniversary of issuing the Message to Compatriots in Taiwan failed to grasp Taiwanese citizens’ aspiration for autonomy and democracy”? Does he care for Hong Kong citizens’ aspiration for autonomy and democracy? No, he tramples on their aspirations. Does he even care for Xinjiang Uyghurs’ aspiration to live their culture? No, he eradicates their culture, their language and their human dignity. All he cares about is that everybody complies with his aspiration for a great China, his China dream. What indications are there that Beijing is interested in “a peaceful resolution of cross-Strait disputes”? 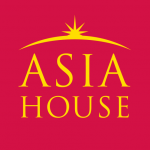 Do they employ diplomatic means to resolve South China Sea disputes? No, they create hard facts on the ground and protect them by military installations. All they are interested in is a successful take-over of Taiwan, not interested are they in an image that is “conducive to a peaceful resolution of cross-Strait disputes”. Therefore, they don’t mind that their “tactics of diplomatic isolation and military coercion will only reinforce the image of a ‘hostile China’”. There is a difference between a poll and a referendum. The answer to a poll question carries no responsibility, it is just an expression of opinion. However, the vote in a referendum may lead to huge consequences, hence carries responsibility. So, why would anyone be surprised that election and referendum results to not square with poll results on identity? Do we really need ‘rational choice theory’ to understand this or would common sense do? My Taiwanese friend resents to be identified as Chinese. She would prefer to be seen as Taiwanese. However, she judges Taiwanese politicians harshly who focus on cross-Strait relations and neglect the well-being of citizens in the process. Don’t rock the boat, don’t sell the boat, rather keep it moving forward. That’s what people want, unfazed by what academics deem rational or not.